Some pieces of furniture stick in my mind, lodging firmly in the "I must get round to making one of those" section of my mental to-do list - which gets longer every day. 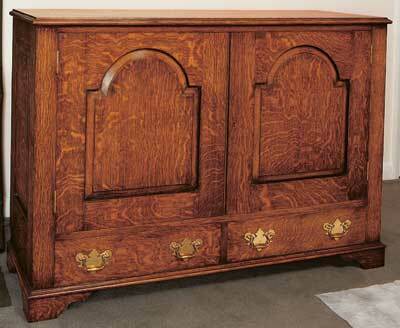 One such piece is the relatively humble mule chest. 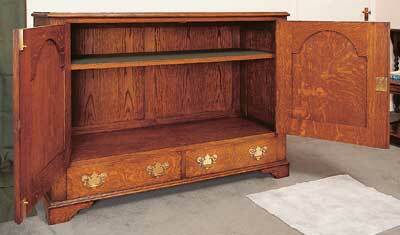 A mule chest is a sophistication of one of furniture's most basic forms; the storage box. The earliest chests, or coffers, were formed by joining six planks - front, back, sides, bottom and top - and though the planks later became panelled frames, the basic lidded box remained the fundamental storage solution for hundreds of years. box chest sitting on top of a couple of drawers. Leaving aside the practicality of the piece, I find the visual balance of framed and fielded panels, above drawers with plate handles, especially pleasing. Add another of my favourites, bracket feet, and some nicely-figured quarter sawn oak, and a truly classic piece of English furniture results. I've been waiting for an opportunity to make one of these for years, and then two of my regular clients, Chris and Mel, made the mistake of telling me that they wanted a sideboard, but had no idea what kind. "You want something like a mule chest" I said. The only drawback of the mule chest is the lift-up lid, making it unsuitable for display objects on top and requiring more leaning over to access the contents than most people want to be involved with. The panelled front, however, may be subverted into doors without visual clashing, and this allows the top to be fixed. I drew two versions of this piece for the clients to choose from, one with square-panelled doors and another featuring the broken-arch panels shown here. With a little nudging, they chose the right one! 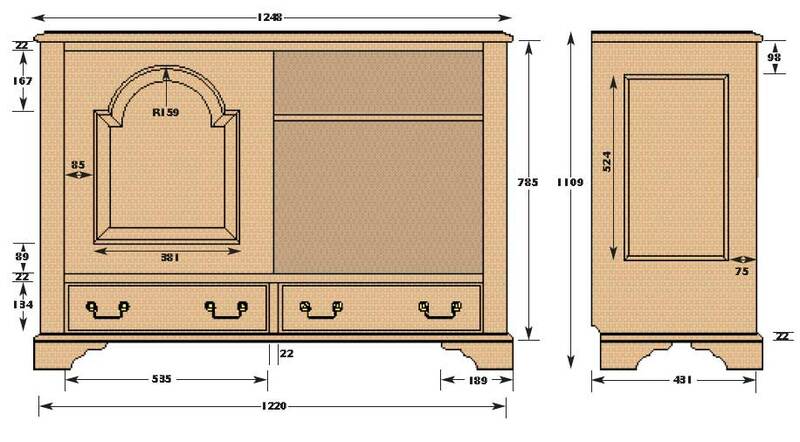 Unless you are very familiar with this kind of work, make up a full-size drawing on MDF, or similar, before starting. It is easier to work out the relationship of the parts with a pencil in your hand than with a saw. 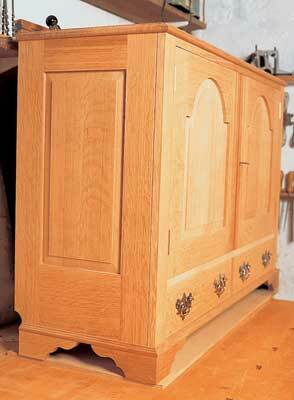 With traditional oak furniture, the quality of the timber used is of paramount importance. The heavy visual blocks involved must be broken up by colour, grain and texture to avoid a sombre, funereal look. In this I was the beneficiary of a happy accident - the timber supplier failed to deliver when arranged, and by way of apology supplied me with their very best selected quartered oak - I bought about 8 cu ft of generous 25mm (1in) thick stuff for this chest, which allowed for further selection as I made up the cutting list. There is only one way to get a cutting list out of waney-edged English oak while obtaining the best visual effect for critical components - and that is to lay out the boards on the workshop floor and mark out the parts with wax crayon, nesting them together to avoid wastage. At least that's how I used to do it when I had a workshop floor to speak of. Now things are more cramped I have to stand all the boards on their long edges, flipping through them like a card index. It is worth spending time on this stage, though, to avoid the best figure ending up on internal parts! Although this is a classic piece, I departed from traditional construction quite severely in places. 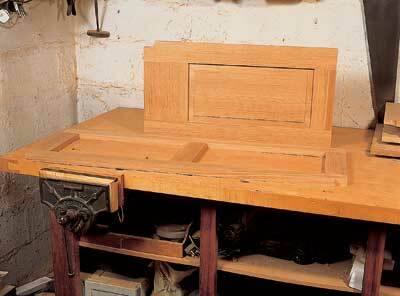 The carcass sides and doors have, in place of mortice and tenons, tongue and groove joints. This is quite safe in this instance, as the solid panels add strength, and the stiles and rails are very wide, allowing a long joint. Glue technology is so much more advanced now than in the 18th century that, provided that the gluing area is large, mechanical strength is less important than it once was. Polyurethane glue, such as Gorilla Glue or Titebond Polyurethane, was used throughout and is a good performer, which doesn't leave black stains on oak. The panelled sides are held apart by jointed frames - morticed and tenoned this time - top and bottom, with a solid horizontal division between the drawers and the cupboard. These three horizontal carcass members are biscuit-jointed to the sides, and cut round the vertical facings which are also biscuited to the carcass sides. A drawer divider is biscuited in place between bottom frame and fixed shelf. 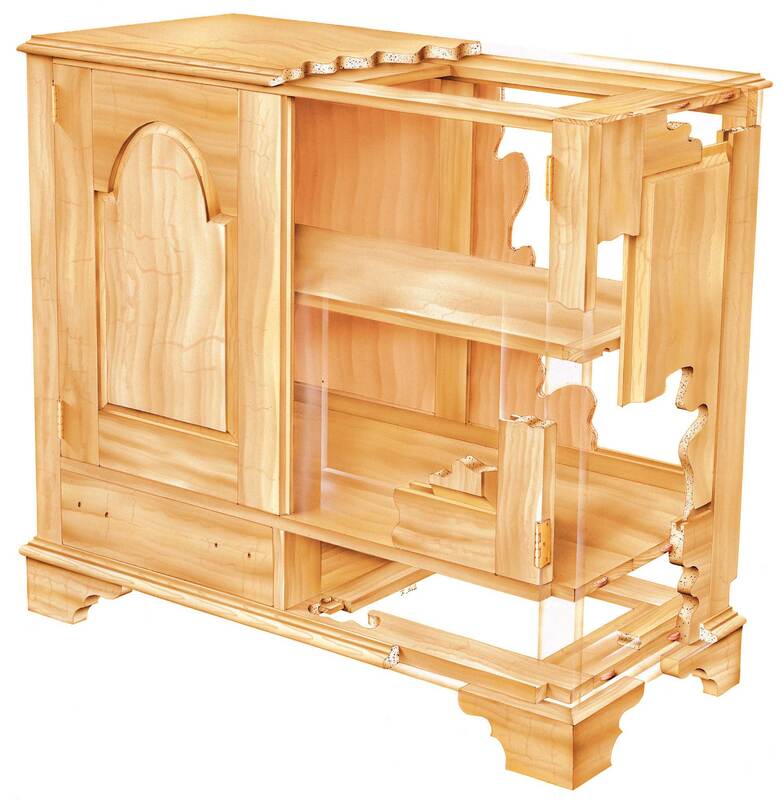 The back is another mortice and tenoned frame, this time grooved to take loose panels - it extends down only to the fixed shelf, leaving the back of the drawer apertures open. The drawers themselves are as conventional as they come, hand dovetailed and so on, and the bracket feet are made according to 18th century norms, complete with glue blocks. To allow the feet to sit wider than the carcass, a moulding is planted around the bottom of the carcass. The top is slot-screwed to the top frame from below. Cut all parts from the sawn boards, then plane and thickness to finished sections. I like to achieve a set of sub-assemblies as soon as possible, so the first job is to join the boards needed to make up wide compo-nents, in this case the panels, shelves and top. I biscuit these, but make sure that the biscuits are far enough away from the ends not to be revealed when cutting the panel-raise. Now the frames for the sides and doors can be made up. Remember to add an allowance to the width of each door's inner stile for the closing rebates. I used a pair of tongue and groove router cutters made by The Wealden Tool Co. for the jointing - they cut a 12mm (1/2in) long by 6mm (1/4in) thick tongue on the ends of the rails, and a corresponding groove in the inner edge of the stiles and rails, which takes both the rails' tongues and the dry-fitted panels. Don't even think of using a hand-held router for this job - a nice flat router table with a mitre guide is essential. Cut the tongues first, then the grooves. Leave the upper door rails square for this operation, cutting their arches, see panel, last of all before completing the groove - carefully! Before changing the cutter, groove a 150mm (6in) long piece of scrap. Now for the panel raising. This is another job for the router table, this time with a large diameter panel-raising cutter - this must have a guide bearing for the shaped work, although the straight edges are best fielded against a fence. These cutters are not safe at high speeds; only use them in variable speed routers, set to the slowest speed. The aim is to produce a raising with a flat tongue which fits the groove in the stiles and rails; do this by gradually increasing the height of the cutter, checking for fit with the grooved piece of scrap - try this all the way round each panel, as the cut can vary. I find that two passes at each depth setting evens it out. Make each pass across the ends of the panels first, then along the long grain, to avoid tearout. That's all very well for the square side panels, but the broken arches of the door panels need a bit more work. Leave the panel square, but cut to width, while you field the bottom and sides of these - then complete the broken arch, see panel. Finish-sand the panels, then glue-up the doors and side panels. If the rails' ends were square before assembly, it is hard to end up with an out-of-square panel, but I make these assemblies a little over-size to allow for final dimensioning after they are made up. 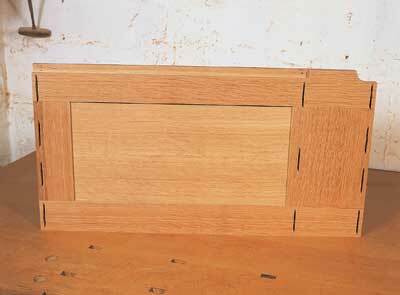 The side panels may now be rebated for the back, and the skirting board relief - if required - cut. Having used a tongue and groove joint for doors and sides, you might expect me to use them for the frames which make up the top, bottom and back of the carcass. Wrong! The sections of the components involved, in relation to the overall size of the frames, are smaller, making for less gluing area and greater racking stresses. 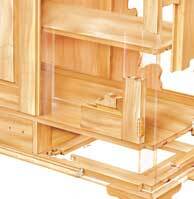 As a consequence, good old-fashioned mortice and tenons are used, which should please the purists. The inner edges of the back panel's frame are grooved for dry-fitted panels. Again, I make these a little oversize and trim after assembly - note that the back panel is fixed straight onto the top frame and solid horizontal member, while it is rebated into the sides. 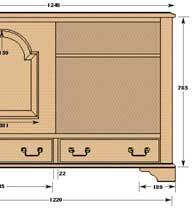 Top and bottom frames, and the solid carcass member which forms the floor of the cupboard, project in front of the carcass sides by the thickness of the side facings, see main illustration, and must be notched to accommodate them. I cut these notches before assembly, but if you are feeling your way through this piece it might be better to glue-up first and then cut to fit. Before gluing-up, though, one more part must be made up - the drawer divider. This is made from two pieces of oak; the main part with grain running front-to-back, with a smaller piece to form a muntin rail biscuited to the front. This is, in turn, biscuited between the bottom frame and solid member. All three horizontal parts should now be ready for biscuiting to the sides. Top and bottom are straightforward corner joints cut from the biscuit jointer's fence, the mid-panel joint for the solid member is made using the drawer divider as a guide for the jointer's base plate. Having cut these, glue and cramp in the following order: first, make up the drawer divider, bottom frame and solid member as a sub-assembly, cramp and allow to dry; next glue and cramp this and the top frame between the sides, paying particular attention to square and the lining up of front edges. Once this lot is dry and cleaned up, cut notches for the side facings if you haven't already done so, then biscuit the facings to the edges of the sides. If you have a biscuit cutter for the router, it is possible to fit a biscuit across the top and bottom of these, inside the notches. Give everything a good clean up, planing the various bits that make up the front of the carcass flush, and rout a small V-groove along the join between sides and facings to tidy it up. The main structure is now complete, which seems like a good time to pause. Next month we'll do the twiddly bits. "It is easier to work out the relationship of the parts with a pencil in your hand than with a saw"
The flat inner area of the fielded panel must be topped with a full half-circle - this means that the outer perimeter of the panel is less than a full half-circle, as is the radiused inner edge of the top rail. Because the panel is grooved into the rail, its outer radius is greater than the rail's - I strongly recommend making a full-size drawing first! You will notice that the cutter leaves a radiused internal corner where the internal mitre should be, see photo A - this can only be completed by the use of chisels. First define the quirk of the raised, flat part of the panel by scribing downwards with a wide chisel and paring a flat at the top of the chamfer, then doing the same for the tongue at the base of the chamfer, see photo B. To be absolutely correct, the intersection of a curved moulding with a straight one should be a curve, but life's too short for that, frankly, so scribe a straight mitre line, again with a wide chisel, from corner to corner. Don't go too deep. Now pare the chamfer of the shoulder, working in towards the mitre. A wide chisel will do most of this, but a skewed chisel will help to finish off. Complete this side of the mitre before proceeding, see photo C.
Finish the job by paring the arch's chamfer, again working towards the mitre, although you may find it easier to make the cuts across the grain. This process sounds worse than it is - my carving skills are pretty feeble, but I managed to produce the results shown here quite quickly, see photo D.